The village of North Curry forms the core of North Curry Parish, with more than half (56%) of the parish population occupying 10% of the land area. North Curry is one of a string of settlements built on a sandstone ridge above the Somerset Levels on a finger of land stretching out from Taunton, the county town of Somerset. 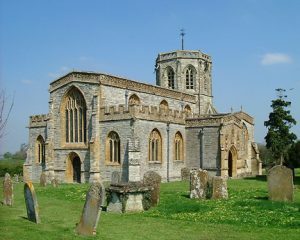 There is evidence that this favourable location led to occupation by the Romans, and in subsequent times it has contributed to the area’s prosperity: the Parish Church is far larger than might be expected for a village of this size, and there are a number of “big houses” in and around the centre of the village. Located between the historic market towns of Taunton, Bridgwater, Langport and Ilminster, in past centuries North Curry village itself had a market granted by Charter of King John. Reclamation of the surrounding moors before 1311 allowed the village to expand. A market village since the 13th century, North Curry’s sources of wealth have included hunting, fishing, and the wool trade, with access to other markets via the nearby River Tone. The centre of the village is currently designated a Conservation Area. The village is contained by Hay Moor and Curry Moor north of the ridge, and by West Sedge Moor to the south, peat moors within the wetlands known as the Somerset Levels. The name Curry may derive from St Curig, who came across the Bristol Channel to convert the heathen English, though that was after Athelney had sheltered the saintly King Alfred. North Curry village serves as a resource for the rest of the parish and for other villages nearby. In 2006, villagers opened a coffee shop, staffed by 70 volunteers, in a converted barn. The coffee shop offers artwork and crafts by local artists, along with hot food, homemade cakes, and good cheer. Proceeds from the coffee shop go to charity. The coffee shop is part of the refurbished Town Farm Barn, in the loft of which are housed the North Curry Archives. Apart from artefacts from the past, the records of people and places going back centuries are being sourced daily for those seeking Family Tree Information. The village is well-provided with community facilities, and is designated in Taunton Deane core strategy as a minor rural centre. There is a primary school, health centre, playing field and cricket/football ground each with their pavilion, village hall, public house, hairdresser and village store with Post Office counter. There are three churches: the (Church of England) parish church of St Peter and St Paul, Methodist Church and Independent Baptist Church. The geology of the local area makes the buildings distinctive. North Curry sandstone outcrops in small areas and is used as a building stone close to its source. Blue Lias limestone is found in the eastern part of the Blackdown Hills, in a prominent ridge extending to Hatch Beauchamp and Langport. Ham Hill limestone has been quarried west of Montacute since Roman times and is the most widely used stone for dressings in Taunton Deane, particularly on churches and older, high status, country houses. There is evidence on Ordnance Survey maps of small quarries, for example on the driveway to Moredon House. 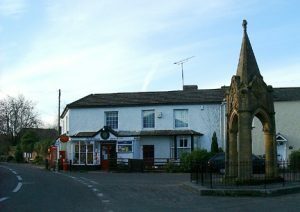 Queen Square in the centre of the village has a Post Office and general store with a central green, a War Memorial and a memorial to Queen Victoria. Evidence of the prosperity of the village can be seen in the exemplary architecture, including 68 listed buildings. The Church of St Peter & St Paul is nicknamed ‘The Cathedral of the Moors’. It dates from the 14th century and has been designated a Grade I listed building. The church is Norman in origin, with the lower stages of tower, transepts and nave being built around 1300 although only the north doorway survives from the original church. The church was erected on the site of an earlier church. Episcopal records in Wells mention a church in North Curry as early as 1199. 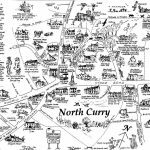 To assist visitors in tracing their ancestry to North Curry, the church has posted a map of the graves in the graveyard. To explore the village and surrounding area there is a diagram of North Curry village mounted on the green by the war memorial.